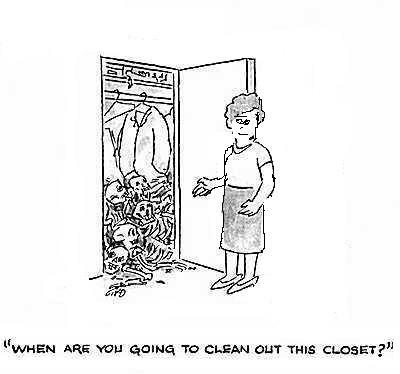 Some of us have more skeletons in our closet than others. I guess you could call me the queen of skeletons. I tend to put everyone else’s sins in the closet of my soul, as well as my own. 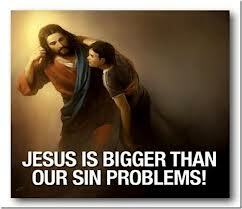 The skeletons of mistakes, sins and foolish decisions had filled my life. If there is any way to take the blame, I would carry it. Many people are more than willing to put the blame on me or someone else if they can. One by one I took the skeletons out putting them in boxes. There were some old bones that weren’t mine. The boxes are heavy and full, but as I give each of them to God my soul begins to feel light and free. I could go into detail about my skeletons, but I cleaned them all out, put them in boxes and gave them to God. He burned them with the rest of the wood, hay and stubble of my life and filled me with his Spirit. All the works of the flesh, world and devil are gone leaving me with a fresh new song in my heart of Praise to God for lifting my soul out of the mud and mire. This is a process that often has to be done as the skeletons come up. Pack them away in God’s box of forgiveness and let Him set you free to have a future and a hope.